1.How does this design ferment beer properly if there is no airlock? Numerous commercial breweries, around the world, make excellent beer using open style fermenting vessels. So an airlock is not required but the DIY Beer Kit comes with a lid to prevent ingress of foreign organisms while allowing CO2 gas to escape. 2.Do I need to use the Krausen Kollar with every brew? You can ferment your brew without the Krausen Kollar in place if you like. However, we recommend using the Krausen Kollar because it increases the total headspace, which helps to contain the foam. Also, it catches the deposit made by the foam – once the foam collapses the Krausen Kollar may be removed while the deposit is still soft and moist, then easily cleaned ready for the next brew. 3.What are the two white clips for? 4.DIY Beer: The tap is a bit difficult to put together and operate so is it okay to use a lubricant? 5.Once the brew is mixed I notice material floating and settling to the bottom of the FV, is this a problem? Don’t worry, this is known as “cold break” and it’s perfectly normal. In fact, it is a good thing! Normally, Cold Break forms in the brewery when the wort is cooled. However, our beer kits and malt extracts are not allowed to cool prior to being concentrated to about 80% solids. At this density, the cold break cannot precipitate out of solution when cooled. Cold Break can only precipitate out once the beer kit and or malt extract is reconstituted (diluted with water). 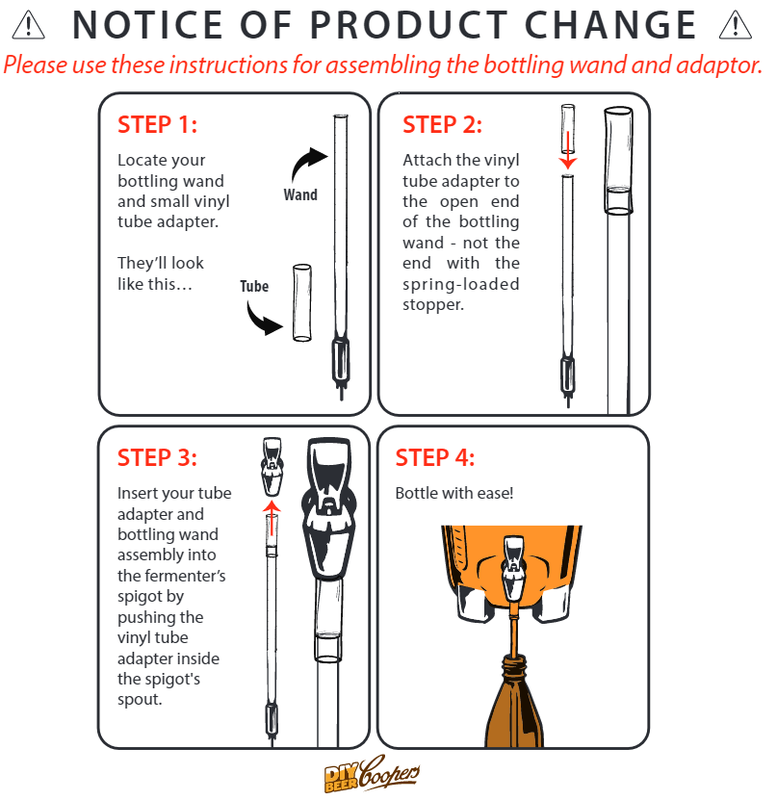 6.Do you have instructions or can I watch an instructional video on how to use your DIY Beer Kit? 7.Do you have a brewing forum? You are sure to find helpful tips and advice from avid DIY brewers & our friendly DIY Beer staff when you visit our interactive 'Talk Brewing' Forum on our Coopers website. 8.Who should I contact if I cannot find the answer to my brewing questions in the FAQs or the Forum? 9.How do I determine the amount of alcohol in my brew? The approximate alcohol content can be calculated by measuring with a hydrometer the density (known as Specific Gravity, SG) of the brew before it has started fermenting and once it has finished fermenting then plugging these two figures into a formula. It is important to stress that we, as DIY Brewers, can’t measure the alcohol content directly and this method is only an approximation of the percentage of alcohol by volume (ABV). For example, a brew with OG = 1036, FG = 1012: (1036 – 1012) / 7.46 = 3.2% ABV. Note: allow for an extra 0.3% to 0.5% ABV due to the addition of Carbonation Drops (or sugar) in the bottle. 10.Do you have an online version of the Brewers Log? The brewers log is designed to be used over and over with the marker provided in the DIY Beer Kit. If you need a Brewers Log please call the Brewing Helpline 888-932-9678 or email customerservice@diybeer.com. To record your brews electronically download the Coopers DIY Beer iPhone App. 11.Who should I contact if I cannot find the answer to my brewing questions in the FAQs or the Forum? 12.Do I need to sanitize all the brewing equipment? The first time you use your kit from new, you can just rinse it in hot water. Just remember, whenever you’re cleaning your equipment, only use a soft cloth that won’t scratch it. For future brews, we recommend that you sanitize all your brewing equipment before each brew with either the Coopers Sanitiser or a non-scented household bleach. Dissolve 4 capfuls of Coopers Sanitiser in the fermenting tub with a liter of hot water. Place all equipment in the fermenting tub, fill to the brim with cold water and let soak overnight (or at least 2 hours). Drain the fermenting tub through the tap and rinse all equipment with hot water. The fermenting tub lid need only be cleaned then rinsed with hot water. Add ¼ cup of unscented household bleach to the fermenting tub. Place all equipment in the fermenting tub, fill with cool water and let soak overnight. Rinse out with hot water to remove all traces of chlorine smell. 13.How do I know when fermentation is underway? 14.What is a Hydrometer and when do I use it? The hydrometer is a calibrated device for measuring the density of a fluid relative to water, known as the Specific Gravity (SG). When floating, the SG is read at the point where the graduated scale cuts the fluid level. The recipe in this kit should start with an Original Gravity (OG) around 1047, and finish with a Final Gravity of 1006 - 1010. To get an accurate reading you may need to 'de-gass' your sample. To dislodge bubbles clinging to the hydrometer tap the floating hydrometer downward so that it bumps on the base of the measuring tube. Please note that FG will vary from brew to brew so it’s important to ensure that the FG is stable over two days prior to bottling. 15.How can I keep the temperature of my brew right? Try to keep the brew at the lower end of the 21°C-27°C range. Some ways you can do this include storing the fermenter inside at ambient temperature, placing it in an insulated cabinet, wrapping it in a blanket, purchasing a heat belt or placing the fermenter in a tub/sink of cool water. 1.How much beer does the DIY Beer Craft Brew Kit make? The DIY Beer Craft Brew Kit is designed to make 8.5 litres of beer. 2.What are the dimensions of the Craft Brew Kit? The total volume of the Craft Brew Kit is 15 litres (Fermenting Vessel = 13.3 litres & Lid = 1.7 litres) specifically designed to accommodate 8.5 litre brews with 4.8 litres head space (the space required for foaming during fermentation). Fitted with the Craft Krausen Kollar extends the head space by 2 litres. Higher alcohol brews, darker brews or brews using a vigorous fermenting yeast strain may require the krausen kollar. For more information view the Craft Krausen Kollar Instructional Video. 3.Is a Krausen Kollar available for the Craft Brew Kit? 4.Where can I buy brew cans for the Craft Brew Kit? Coopers have produced a range of craft beer styles specifically for our US sister company; Mr Beer. The Mr Beer American Craft Series is a premium range of 100% Malt beer brew cans specifically designed to produce a fuller bodied, full flavored beer typical of these craft beer styles. Each variety uses only the best quality malts, bittering and aromatic hops and specially selected yeast. All designed to make 8.5 litres of quality craft beer, they are available to purchase online at here. 5.What other products are available for the Craft Brew Kit? 6.Are there instructions for the Craft Brew Kit? An Instructional DVD is provided with the kit, or you can watch the Craft Brew Instructional video online here. 7.Are there any recipes available specifically for the Craft Brew Kit and Craft Series Range? Yes, there are recipes available here.. DIY Beer recipes are added to the list on a regular basis. 8.Can I use the Coopers 1.7kg Brew Can in the Craft Brew Kit? The Craft Brew Kit is specifically designed to make 8.5 litres of beer using the brew cans in the Craft Series. and therefore could make the final beer unpalatable for your taste. There are more Craft Brew Recipes available should you wish to experiment further. 9.Do I need to sanitize all the brewing equipment? We recommend that you sanitize all your brewing equipment before each brew with either the Coopers Sanitiser or a non-scented household bleach. 1. Dissolve 2 capfuls of Coopers Sanitizer in the fermenting tub with a litre of hot water. 2. Place all equipment in the fermenting tub, fill to the brim with cold water and let soak overnight (or at least 2 hours). 3. Drain the fermenting tub through the tap and rinse all equipment with hot water. 4. The fermenting tub lid need only be cleaned then rinsed with hot water. 1. Add ¼ cup of unscented household bleach to the fermenting tub. 2. Place all equipment in the fermenting tub, fill with cool water and let soak overnight. 3. Rinse out with hot water to remove all traces of chlorine smell. 10.Where do I use the lid clips? You will find two small lid clips in your kit. These clips are used to secure the lid to the fermenter. When using the Krausen Kollar (sold separately in Australia) during a more vigorous or high foaming brew the lid clips are used to secure the lid to the Krausen Kollar. Please note: Never clip the Krausen Kollar to the fermenting vessel. The approximate expected alcohol percentage by volume (ABV) will be 5.5% using the 1.3kg Craft Series Brew Cans. 1.Where can I buy Coopers Brewing products? 2.What is a Carbonation Drop? Coopers Carbonation Drops look like boiled lollies and contain the equivalent of 3g of sugar. Use them instead of measuring out white sugar to speed up the bottling process. The drops will dissolve within an hour and plume through the brew so there is no need to invert the bottles. 3.What's the difference between Brewing Sugar, Brew Enhancer 1, etc? 4.Why is the BEST BEFORE date on the can okay but the yeast is out of date? The code on the yeast sachet is a Julian Date, representing the date that the yeast was packaged rather than a “Use By” or “Best Before” date. e.g. a sachet with 25007 was packaged on the 7th of September, which is the 250th day of 2007. While the beer kit, containing this yeast sachet, may have been produced on Thursday the 13th of September 2007, carrying a Best Before date of 13/09/09. 5.Will the brew be okay to make if the can is past the ‘Best Before’ date? Coopers Beer Kits contain hopped liquid malt extract. Liquid malt extract darkens over time and develops toffee/molasses like aromas. This process is accelerated when temperature is increased. This is not such a bad thing with intentionally dark brews but may be undesirable with lighter styles. If you wish to persist with making up a brew past its Best Before date (out of curiosity or otherwise) it’s worth getting fresh yeast from a Brewing Specialist store to ensure that the brew ferments thoroughly. 6.The quoted Coopers Beer Kit bitterness and colour figures seem very high! The figures we quote for colour and bitterness are specified for the product inside the can at the time of packaging. Of course, the product is concentrated, hence the seemingly high figures! The figures become more realistic once they are plugged into a formula for estimating the colour and bitterness of the reconstituted and fermented brew. Multiply the quoted product bitterness by the weight of the product (1.7kg)* and divide by the total brew volume (normally 23 litres). * We use the weight because our quoted colour/bitterness figures are based on a 10% weight/volume dilution. This figure represents the brew bitterness prior to fermentation. Generally, fermentation reduces colour and bitterness by between 10 to 30%. So final bitterness of the fermented brew may be anything from 14 to 18 IBU. Colour may be calculated in the same way. Ensure to add the colour contribution of all ingredients together. Colour figures are quoted for liquid extract at the time of packaging as these products will darken with time. The darkening process is accelerated by exposure to elevated temperature. 7.Can I use normal sugar with non-alcoholic Ginger Beer instead of carbonation drops? As some may not have scales to measure out the correct amount of sugar, carbonation drops are suggested for no other reason than convenience. For a volume of 20 litres, 160g (a rate of 8g per litre) of sugar may be added during “Step 1”(initial mixing of ingredients), negating the need for carbonation drops. 8.Is Brew Enhancer supposed to be added as well as sugar? Coopers Brew Enhancer 1 contains Dextrose and Maltodextrin while Coopers Brew Enhancer 2 contains Dextrose, Light Dry Malt and Maltodextrin. They are intended to be used instead of white sugar or dextrose. For more consistent carbonation levels, Coopers Carbonation Drops or normal white sugar should be used for priming the bottles. 9.Should I boil the kit to remove break? We brew beer, malt extract and beer kit wort in the same way. All worts are boiled and produce hot break, which is then removed in the whirlpool. Rather than being cooled down for fermentation, the malt extract and beer kit worts are centrifuged and transferred to evaporators where all but around 20% of the water is removed. At this stage the malt extract or beer kit wort is packaged then it cools down but does not throw cold break material because the extract is too dense for it to precipitate. Once you add water, the wort becomes thin enough for the break material to precipitate. This break material is completely harmless to the brew and will settle out during fermentation. If boiled the break material may clump together giving the impression, incorrectly, that it is hot break. Boiling a beer kit (hopped malt extract) will only darken the brew and drive off hop aroma. However, if you are following a specific recipe and using additional hops, you may like to boil some of the malt extract to achieve the expected hop utilisation for correct aroma, flavour and bitterness in the finished beer. 10.Why is the non-alcoholic Ginger Beer not left in the fermenting tub to ferment like other brews? The non-alcoholic version of Coopers Ginger Beer only undergoes a single ferment. This ferment occurs in the bottle while the fermenting tub is used only for mixing the brew. The ferment in the bottle serves to carbonate the brew. Of course, with any fermentation, some alcohol is produced (approx 0.7% ABV) but not enough to be considered as an alcoholic beverage (< 1.15% ABV). Being a primary fermentation, there will be a small deposit around the fill line of the bottle as well as the normal sediment at the bottom. 11.Can I use half the 1.7kg DIY beer kit to make a smaller brew and then use the other half later? Yes you can but the balance of the kit must be covered with cling film and stored in the refrigerator for no longer than two weeks. Although not usually recommended for our kits, as in this case the product will have been opened and stored for a period, you should boil the second half prior to using it as insurance against possible infection occurring in the brew. Bear in mind that boiling a beer kit may result in the loss of hop aroma and flavour and darkening of the brew. 12.What strain of yeast is supplied with with my brew can? Ac = Coopers ale yeast (our own strain, not the same as the yeast in our commercial ales, developed in-house and propagated under contract). A = ale yeast and L = lager yeast (these strains are commercially available dry yeast and their details are held in confidence). 13.Where can I find instructions for the brew cans? Each series (Original, International and Thomas Coopers Selection) have a set of brewing instructions under the lid of each brew can. If your instructions are missing from under the lid or you have misplaced them, you can download a PDF copy here. If you don't plan to make your brew can up straight away, store the yeast (found under the lid) in the fridge to keep it fresh. Comment - from time to time a Brewer may experience an infected brew. Fact - all non-commercial beer carries some level of infection. Fortunately, infection is only apparent once the off flavours and aromas reach a certain threshold (perceivable level). Some of us are more sensitive to this than others. Aroma; vinegar, medicinal or solvent smell. Taste; sour, sharp or harsh flavour. Remedy - clean and sanitise all equipment that will come in contact with the brew to minimise the symptoms of infection. Soak equipment in water until caked on residue is softened. Remove residue with a soft cloth and rinse thoroughly. Pay attention to ‘hard to get at’ areas. Remove and clean the tap, particularly the threads. NOTE: Do not use any cleaning aid that may scratch the plastic. Dissolve 4 capfuls of Coopers Sanitiser in the fermenting tub with a litre of hot water. Bottles – Clean bottles may be filled with sanitising solution drained from the fermenting tub after soaking for 2 hours, left to soak for a further 2 hours, then drained from the bottles. Coopers PET bottles and soft drink bottles should be sanitised and rinsed with cold/warm solution. 2.How do I crack the grains in my recipe? Many brewing specialist stores will crack the grains for you. However, if you are not likely to use the grains within a day or so, it may be a better option to crack them as needed. A simple, no-mess method, requiring only a zip-lock plastic bag and a rolling pin - place the grains in the zip-lock bag and seal, lay the bag flat on a bench top (spreading the grains evenly within the bag) and run a rolling pin over the bag. For best results, do not over fill the bag. As such, it may take a few fills of the bag to crack all the grain. 3.What can I do to control the temperature of my brew? Most brewers find it easier to keep warm (with insulation) rather than cooling their brew because the brew generates heat as it ferments. Wrap the fermenting tub in a 0ºC-5ºC rated sleeping bag , blankets or an old jacket. Place the fermenter in a large esky, insulated box, non-working fridge or freezer. Sit the fermenting tub in a laundry tub with frozen PET bottles. Place the fermenter in a cellar or on a cool bare concrete floor. Partially roll a towel and place in the lid of the fermenter, fill the well of the lid with cold water and drape the towel over the side of the fermenter allowing the water to wick down the towel. Heat pad or heat belt. Tea chest, box, cupboard, old fridge etc. with a 25W-40W incandescent lamp controlled by a thermostat, dimmer switch or timer switch. Place in an air-conditioned room. Place in a working fridge or freezer with modified thermostat. Place near an inside storage hot water system. Wet towel method with an electric fan blowing over it. 4.How do I get my brew to hold a head? - Glassware has residual detergent or grease. - Young beer can produce a large foamy head that quickly dies away. - Too much simple sugar (sucrose or dextrose) in the brew. - Low carbonation level in the beer. - A racing ferment due to high temperature. To check your glassware, get some clear (crystal type) plastic glasses from the supermarket. Pull one straight out of the plastic wrap and place it beside your favourite glass. Fill both with the same brew and compare head retention. Head retention can usually be improved by adding around 300g of maltodextrin to the wort. Replacing some of the sugar/dextrose with malt extract will have the same affect, with the added bonus of extra malt flavour. 5.Can the yeast in a Coopers Ale be reactivated for fermenting my brew? Coopers, encourage DIY brewers to use the yeast from naturally conditioned Coopers ales. The same ale strain is used across the range - Mild Ale, Pale Ale, Dark Ale, Sparkling Ale, Best Extra Stout, Celebration Ale and Extra Strong Vintage Ale. 1. Buy a six pack of Coopers Original Pale Ale and place upright in the fridge for about a week for the yeast to settle. 2. Mix about 600ml of boiling water and 4 tablespoons of sugar (60g) in a pyrex jug, cover with cling-wrap and leave to cool in the fridge for about 30mins. 3. Open 4 bottles and decant the beer into a jug, leaving behind the yeast sediment - about a couple of centimetres. 4. Pour the sugared water equally into each bottle, cover with cling-wrap and secure with a rubber band. 5. Shake the bottles then place them in a dark spot at a temperature in the mid 20’s. 6. Give the bottles a shake in the morning and at night to keep the yeast in suspension. 7. After around 2 to 3 days the yeast should become active and begin forming a head. 8. Pitch the active yeast into a brew immediately or store in the fridge for about a week. Just remember to pull it out of the fridge to warm for couple of hours prior to pitching. - use malt extract rather than sugar when re-activating yeast from your own bottles or other commercial brands. 6.How do I reactivate Coopers Commercial Ale Yeast? Coopers, encourage brewers to use the yeast from naturally conditioned Coopers ales. The same ale strain is used across the range - Mild Ale, Pale Ale, Dark Ale, Sparkling Ale, Best Extra Stout and Extra Strong Vintage Ale. 2. Mix about 600ml of boiling water and 4 tablespoons of dextrose/sugar in a pyrex jug, cover with cling-wrap and leave to cool in the fridge for about 30mins. 1.Is there a beer kit suitable for diabetics? How do I make low alcohol beer? A low alcohol beer (approx 2.5% abv) can be made by using a 1.7kg Beer Kit can mixed to 23 litres and no other sugars. However, please consult your GP on this topic. 2.How do I make a low carbohydrate beer? Carbohydrates in beer are in the form of alcohol and residual sugars. To reduce the amount of carbohydrates in the brew the amount of fermentable materials in the recipe should be reduced. An enzyme (available at Brewing Specialist stores) can be added to the brew to help the yeast metabolise the sugars more thoroughly. 3.How do I make beer suitable for gluten intolerant people? All Coopers Beer Kits contain malt extract - derived from malted barley - and, as such, are not suitable for gluten intolerant people. Many brewers don’t use a hydrometer and have never had exploding bottles. One day their luck will run out! Brewers Yeast is a living organism and, as such, may perform differently from brew to brew. We recommend the use of a hydrometer for checking that fermentation is complete before bottling. The hydrometer is a simple device which, when floated in a sample, gives an indication of the density of the brew. Two separate samples over 24hrs with the same reading indicates that fermentation is complete (Final Gravity - FG). Once FG is achieved, have a taste and a smell of the brew (an infection is usually a sour taste). If it tastes and smells like beer you can bottle confidently in the knowledge that the correct amount of priming will produce the right amount of fizz with no explosions! 2.How long can a brew be left in the fermenting tub? A brew is most at risk of spoilage when the yeast is not active. This may be at the start of the ferment (prior to or just after the yeast is pitched) or at the end of the ferment (when the yeast has sedimented to the bottom of the brew). A brew, fermented with the lid on or clingwrap, should have a protective layer of CO2 gas and may be perfectly fine for several days after fermentation is complete. However, the majority of brewers cannot produce a completely sterile environment for their brew so the longer the brew is left to sit the greater the risk of spoilage. Sample the brew prior to bottling - if it smells like beer and tastes like beer it is probably okay to bottle. 2.How do I connect my bottling wand? 3.Should I use plastic or glass bottles? The Coopers DIY Beer Kit contains thirty 740ml PET bottles. These bottles are also widely available as a separate item (in boxes of fifteen). PET stands for polyethylene terephthalate, which is the same plastic used to make soft drink (soda pop) bottles. Since 2000, Coopers has included PET bottles with the starter kits (initially the Micro-Brew Kit and now the DIY Beer Kit) rather than the traditional crown seals and capper because it was becoming increasingly difficult for new brewers to obtain sturdy crown seal bottles. Today, most commercial beer is packaged in single use glass bottles, which are too thin to stand up to the rigours of continual washing and capping. These bottles carry the words "no refill" embossed on the glass. The majority of PET bottles are subtly porous and a beverage held in PET will eventually go flat. However, Coopers PET bottles have a nylon barrier, reducing the the rate of ingress of oxygen and the loss of CO2 for up to 18 months. The re-usable caps have a tamper evident collar that breaks off after the first use. This does not affect the airtight seal. When the caps eventually wear out, replacement caps can be purchased separately. Note: PET is temperature-sensitive and should not be cleaned using hot water. A beer, such as an Imperial Stout, intended to be aged for 2 years or more, should be bottled into sturdy glass designed for re-use. With this in mind, Coopers also produce Original Pale Ale, Sparkling Ale and Best Extra Stout beverages in sturdy 750ml glass bottles. These bottles have a lip designed for a prise-off crown seal and weigh a formidable 560g empty! They are an excellent option for brewers and sauce makers, alike. There are a couple of options open to you when it comes to kegging. If you are in a hurry for the beer (a party on the weekend) and it will be consumed within a couple of months, then artificial carbonation is the best option. Natural conditioning will give you a better beer in our opinion but the conditioning period is much longer (several weeks as opposed to several days). Well made, naturally conditioned beer will last as long in the keg as it does in bottles (at least two years or so). Artificially carbonated beer will deteriorate after a few months. Clean and sanitise the keg thoroughly. Prime with sugar at the rate of 4g per litre. Rack via a piece of sanitised, flexible tubing so that the beer runs to the bottom of the keg. Leave 5 – 10 cm of headspace at the top. Seal the keg then invert and give it a shake to mix the sugar and check that the seal is good. Store at 18°C or above for a week, then allow the beer to condition for at least two weeks. Refrigerate for a day or two, momentarily release the keg pressure, then connect the gas at required pouring pressure 35 – 100 kPa, depending on your system. (Fifty litre kegs through a temprite or miracle box may require up to 300 kPa). Clean, sanitise, purge (purge by connecting the CO2 bottle to force the air out of the keg) and rack as per the natural conditioning procedure, without the priming sugar. If you are in a hurry for the beer, seal the keg, pressurise to 300 kPa and shake it about 100 times (for an 18 – 20 litre keg) with the gas connected. If there is no rush or you’re not feeling energetic, leave the gas connected with the regulator set at 300 kPa for 2 – 3 days. CO2 will be absorbed more quickly if the beer is refrigerated. Place in the fridge for several days then adjust to pouring pressure. The beer will be drinkable as soon as it is cold, but will improve for several weeks in the fridge. For crystal clear beer, rack into a sanitised, airtight, food grade container (flush with CO2 first) and refrigerate for a week. Once the beer is clear, keg and carbonate artificially. Degassing the keg over a day or two will usually rectify over-carbonation. Agitate the keg and release the CO2 several times a day until the beer has reached the desired level of carbonation. If the beer is pouring badly but appears to have little or no carbonation, check to ensure that there are no kinks or holes in the beer and gas lines. Contrary to logic, heady beer can be a result of low gas pressure and increasing the pressure via the regulator will often fix the problem. A short beer line may also be the cause of heady beer. Look to use about 3m of 5mmID line, 2m of 4mmID line or an in-line restrictor. 5.What is the shelf life of a brew once it is bottled? A well made DIY BEER, being naturally conditioned in the bottled, can be stored for longer than most commercial beer! Generally speaking, a beer style with higher bitterness, alcohol content and colour lasts longer in the bottle and even benefits with bottle age! A beer such as Mexican Cerveza may be consumed within 6 mths while an Imperial Stout may be successfully stored for several years. We suggest tasting a bottle of each brew periodically to gauge how it’s progressing to determine optimum drinking age for your own preferences. Other factors to consider for longevity are the quality of the beer in the first instance, integrity of the pressure vessel and storage temperature (stable and cool). 6.What type of label sheet fits best with the LABELMAKER application? Many brewers wrongly assume that the yeast is not working because there is no bubbling through the airlock. The airlock is fitted to allow gas to escape and prevent micro-organisms and wild yeasts from entering the fermenter. Do not rely on the airlock as an indicator of fermentation activity. Rather than becoming “mesmerised” with the airlock, look for condensation inside the lid, a scum ring at the top of the beer, sediment on the bottom, cloudy / turbid / foamy brew from the tap and the specific gravity dropping (use a hydrometer). 2.Why is my brew foaming over in the fermentation tub? Plenty of foam, although messy, is not a bad thing as it indicates healthy yeast and a strong fermentation. Excess foaming is more likely to occur when using ale yeast with darker brews and higher fermentation temperatures. Also seasonal variations may affect the barley (main ingredient in beer apart from water) causing more foam. To avoid foaming over allow for extra headspace by using a bigger fermenting tub or fill to a lower level (around 18-20 litre mark) then top up with cool boiled water after initial foaming has subsided (normally after a day or two). 3.The airlock bubbles occasionally (once every couple of minutes or so), is it okay to bottle? Don’t trust the airlock! A brew may release CO2 gas even though fermentation activity has effectively ceased. The brew is okay to bottle once the specific gravity (measured with a hydrometer) is stable over 2 days. 1.What device can I download the Coopers DIY Beer App on? The app is available for iPhone or iPad. 2.I live outside of Australia, can I download the App? Yes, the latest version of the Coopers DIY Beer app released 17th November 2014 is available world wide. 3.How do I download the App if I am on my computer? Plug your iphone/iPad into your computer, search for the Coopers DIY Beer Utility and take the steps provided in iTunes to download the app to your device. 4.How do I download the App if I am on an iPhone/ iPad? Visit the App Store and search Coopers DIY Beer or click on this link from your device.